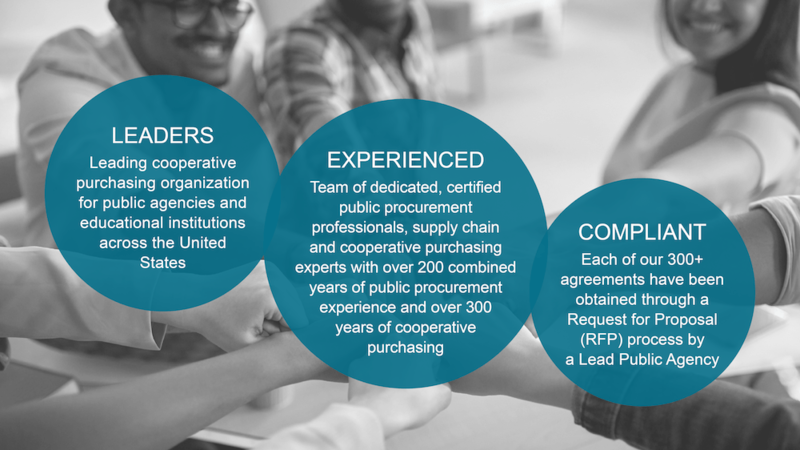 OMNIA Partners, Public Sector is the most experienced cooperative purchasing organization for state and local government, K-12 education, colleges and universities. Use of cooperative contracts reduces the cost of goods and services by aggregating the purchasing power of public agencies nationwide. Our participants have access to the largest portfolio of competitively solicited and publicly awarded contracts with best-in-class national suppliers. All contracts are awarded by a government entity utilizing industry best practices, processes and procedures. Our lead agencies ensure maximum value and absolute security with complete transparency of process. We adhere to the highest standards of procurement so you can feel secure knowing that you are in full compliance with industry regulations. To deliver solutions that benefit the community while providing value, efficiency, product and service effectiveness. To support the ability of public agencies and educational institutions to deliver quality services, by linking public procurement expertise and a competitive marketplace for public benefit. Offering programs and solutions that best meet public sector needs, while adhering to the requirements of the law. Conducting ourselves with honesty, integrity and professionalism, as well as observing proper standards of industry conduct through our employee code of ethics. Following the public agency competitive solicitation process which provides open access to competitive opportunities. Delivering value, integrity and standards through supplier commitments. Developing collaborative partnerships to meet public needs. We support the efforts of public agencies and educational institutions to be socially responsible, economically focused and environmentally accountable by adhering to our cooperative purchasing standards and supplier commitments. OMNIA Partners brings together industry-leading buying power and world-class suppliers.